Sam felt his heart thumping as the two Bedouin men walked toward him. The men's menacing spears were pulled back over their shoulders, ready to thrust at Sam at any moment. From the grim look on their faces, the men seemed intent on killing someone. 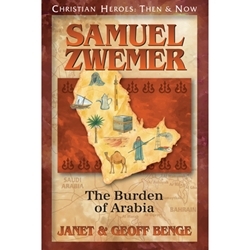 The spiritual needs of the Muslim world, long neglected by Christian missionaries, came to the world's attention again when Samuel Zwemer dedicated himself to the advancement of the gospel in Arabia. It was a tremendous task, but a pledge the young American kept despite opposition, difficulty, and death.